At least 36 persons were killed and many injured in two blasts today, one which tore through the headquarters of a Kurdish party in Baghdad and the other outside a US military base in the northern town of Bayji, the police said. A wounded woman waits for a relative after she was hurt in a car bomb explosion outside offices of the Patriotic Union of Kurdistan (PUK) in central Baghdad on Tuesday. Ghazi Mashal Ajil al-Yawar was chosen as Iraq’s new President today and the US-installed Governing Council dissolved, handing its responsibilities over to Prime Minister-designate Iyad Allawi’s government ahead of the June 30 transfer of sovereignty, a coalition official said. Police exchanged fire with rioting mourners today as thousands gathered for the funerals of those killed in an apparent suicide bombing that ripped through a crowded Shiite Muslim mosque. About 200 Shiites set fire to three buses, a bank, bus company offices and shops housed in one building. The first major defence witness in the Air-India trial denied that he had had an incriminating conversation with a Sikh extremist who is charged with the mid-air bombing of an Air-India jetliner in 1985 that killed 329 persons. A mother of four allegedly cooked and ate parts of her husband’s body after killing him and locking herself up for five days in her room in south-eastern Nepal, the police said today. Nepal ground to a halt today after Maoist rebels called a three-day public transport strike, two days after they planted a powerful bomb on a bus here wounding 22 persons. 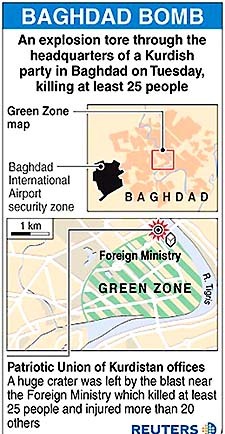 The blast at the offices of the Patriotic Union of Kurdistan, close to Iraq’s Foreign Ministry and an entrance to the “Green Zone” compound where the US-led administration in Iraq is based, was followed by shooting. Policeman Sattar Jabar said he had seen at least 25 bodies and that more than 20 persons had been injured. A huge crater was blown into the ground at the entrance to the building. The blast came as US and Iraqi officials announced an Iraqi government due to formally take over sovereignty from the occupying powers on June 30. Saad Adnan, a driver at the Transport Ministry, said he was driving past the PUK headquarters when it was hit by the blast. He said guards at the building opened fire after the blast, killing some bystanders. Adnan said he saw several bodies. “One of the dead was a woman. Only her head was left,” he said. In Bayji, 11 Iraqi civilians were killed today in a car bomb explosion outside a US military base, a senior Iraqi security official said. “The accident took place at 9.30 am (11 ISI) when a black BMW with a bearded man inside blew up, setting fire to several other cars in the area,” said Lieutenant Hamid Massud of the US-trained Iraqi Civil Defence Corps. (ICDC). “The Governing Council was dissolved this morning. The interim government will take over responsibilities as of today, until sovereignty is fully transferred on June 30,” the official said on condition of anonymity. Iyad Allawi named his Cabinet today, saying that Shiite politician Adel Abdul Mehdi would be the Finance Minister and Hoshiyar Zebari, a Kurd, would remain Foreign Minister. The Sunni Muslim head of the Iraqi Governing Council Ghazi Mashal Ajil al-Yawar was chosen as Iraq’s new President today after America’s preferred candidate, former Foreign Minister Adnan Pachachi, turned down the post, council members and officials said. UN envoy Lakhdar Brahimi confirmed the appointment of al-Yawar as the largely ceremonial head of state. The chaotic scenario — replete with rumors, claims and counterclaims, unfolded after council members angrily accused the American Governor of Iraq, L. Paul Bremer, of trying to strongarm the choice of Pachachi for the largely ceremonial post. Police exchanged fire with rioting mourners today as thousands gathered for the funerals of those killed in an apparent suicide bombing that ripped through a crowded Shiite Muslim mosque. About 200 Shiites set fire to three buses, a bank, bus company offices and shops housed in one building. 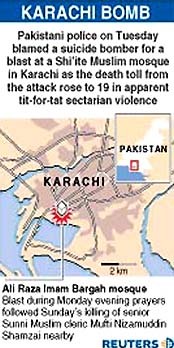 The police fired teargas shells at the crowd along a major highway in the southern city of Karachi. Police and rioters exchanged gunfire in several locations, witnesses said. There was no immediate word on injuries. Two processions of thousands of mourners set off in different directions after prayers at the wrecked Imam Bargah Ali Raza mosque, leaving the rioters behind. 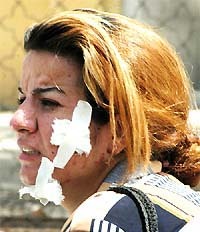 The unrest began after the mob started pelting the police with stones. President Pervez Musharraf pledged action in this regard. Earlier in the trial, a key prosecution witness testified she had overheard Raminder “Mindy’’ Bhandher talking in Vancouver with Ripudaman Singh Malik about the bombing of Air-India Flight 182 off the coast of Ireland. But Bhandher told the British Columbia Supreme Court on Monday that he was in India to get married in the spring 1997, when the conversation was said to have taken place. The prosecution witness said during Bhandher’s conversation with Malik, he warned Malik that a third person was talking openly about who was involved in planning the bombing. Bhandher, (26), whose family is close friends of Malik, said no such conversation ever took place. Bhandher is the first major witness to be called by the defence in the murder trial of Malik and Ajaib Singh Bagri, who are both charged with being perpetrators of the bombing. Prosecutors wrapped up their case two weeks ago. The defence took the unusual step before Bhandher testified of cautioning his credibility was suspect. So, to support his story, they produced copies of his airline ticket to India and of his Indian marriage licence. Bhandher was recently named in a different trial as a suspect in a gangland shooting in Vancouver in 2000. Under questioning by the prosecution, Bhandher said he did not know why the marriage certificate had the wrong birth date for him, or when the marriage was annulled after he returned to Canada without a bride. By calling Bhandher, Malik’s attorneys signaled they were going to make a direct attack on the credibility on the prosecution’s star witness, who testified that Malik told her details of who was responsible for the bombings. The defence said it also planned to call Daljit Singh Sandhu as a witness this week, but that Sandhu had suffered a heart attack over the weekend so it was not known when, or if, he would be able to testify. It said they found the skull of Gopi Krishna Ghimere - an employee of Nepal’s state-run food corporation-simmering in a pressure cooker when they broke the padlock of his wife’s room on Sunday. The woman, Indira Ghimere, pleaded guilty and is undergoing medical and psychiatric checks, the police said. The woman from Mrigauliya village in Morang district admitted she killed her 48-year-old husband, cooked the flesh and ate it. The woman killed her husband on May 25 while he was sleeping and hid with his remains inside her room, where the police also found a jug of blood. Buses and taxis kept off the streets of the capital while very few private cars braved the roads after threats from Maoists. Despite the deepening security and political crisis, however, King Gyanendra said he was unwilling to rush into naming a new Prime Minister to replace the royalist premier who quit last month after weeks of anti-government protests. Palace officials said 34 persons - including a poet, a boxer and a former Prime Minister - had applied for the job, but it was the King’s prerogative to choose someone he believed could make peace with the rebels and hold an election by April 2005. The transport strike fell on the third anniversary of the palace massacre, in which King Birendra and eight of his family were shot by Crown Prince Dipendra. Hopes for a rapprochement between the King and political parties flickered last month when royalist premier Surya Bahadur Thapa resigned after weeks of regular, sometimes violent street protests in Kathmandu. The King then invited the country’s main political parties to suggest a candidate for the job. But they failed to meet yesterday’s deadline to nominate a candidate, insisting it was inappropriate for the King to make the final decision. The palace official said the King wanted a “viable government” that could establish peace with the Maoists, who control vast stretches of the countryside and want to establish a communist republic. 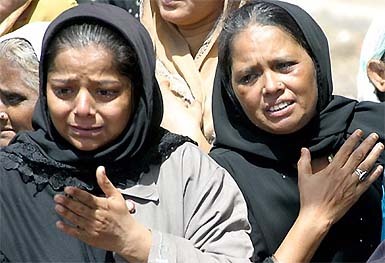 There was no official ceremony on the third anniversary of the 2001 palace massacre, but citizens’ groups organised special Hindu prayers for the slain King. Mogadishu: At least 31 persons were killed and around 40 wounded on Tuesday amid clashes in the southern Somali town of Bulohawo, near the Kenyan border. The bodies of the dead, 25 gunmen and six civilians hit by stray bullets as they were going to morning prayers, littered the streets of the town, eyewitnesses said.